Copper (lat. 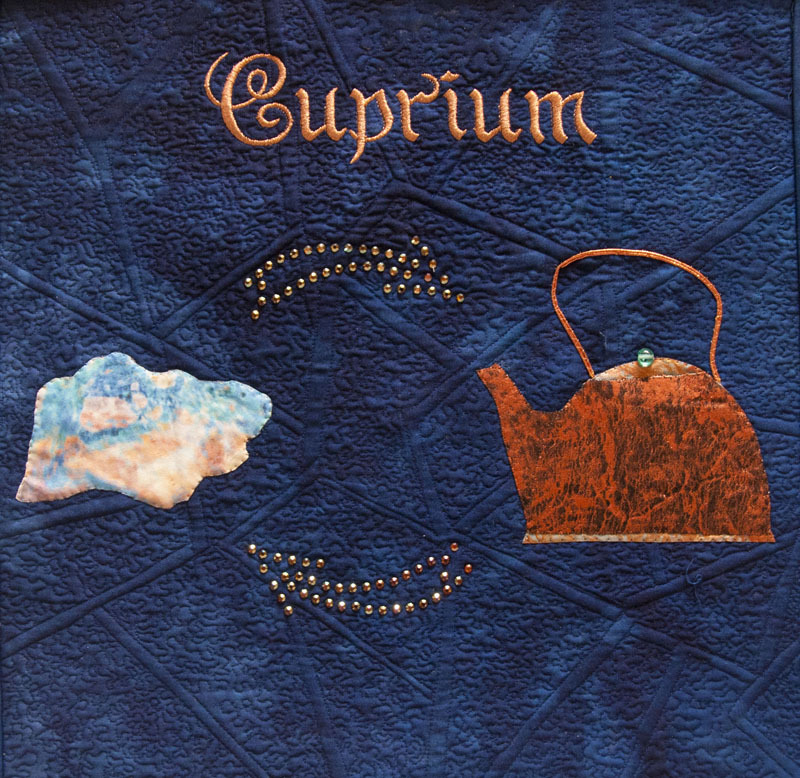 Cuprium) is an element, and its symbol is Cu. Pure copper is soft and malleable; a freshly exposed surface has a reddish-orange color. Copper was mainly mined in Cypress during the Roman era, and its original name was aes cyprium (metal of Cyprus). Large amounts of unmined copper still exist, and copper can be recycled multiple times without any loss in performance, making it sustainable. Copper is a trace mineral which is essential for all living organisms. Its compounds are commonly encountered as copper salts, which often impart blue or green colors to minerals such as azurite and turquoise. The picture on the left, used with the permission of Copper Development Association, shows some of these colors. Copper salts have been widely used historically as pigments. It is used in plumbing, as a conductor of heat and electricity, and as a building material. Copper cookware is popular due to its heat conductivity. In architectural applications copper is a rust-free option, which develops a beautiful blue/green patina over time. It is sometimes used in roofing. This quilt was created using a different order than most of my work. Hand dyed cotton fabric created by Jeanette Viviano was densely quilted with fine silk thread. The machine embroidery and appliques were stitched over the quilted fabric, and then the piece was embellished. 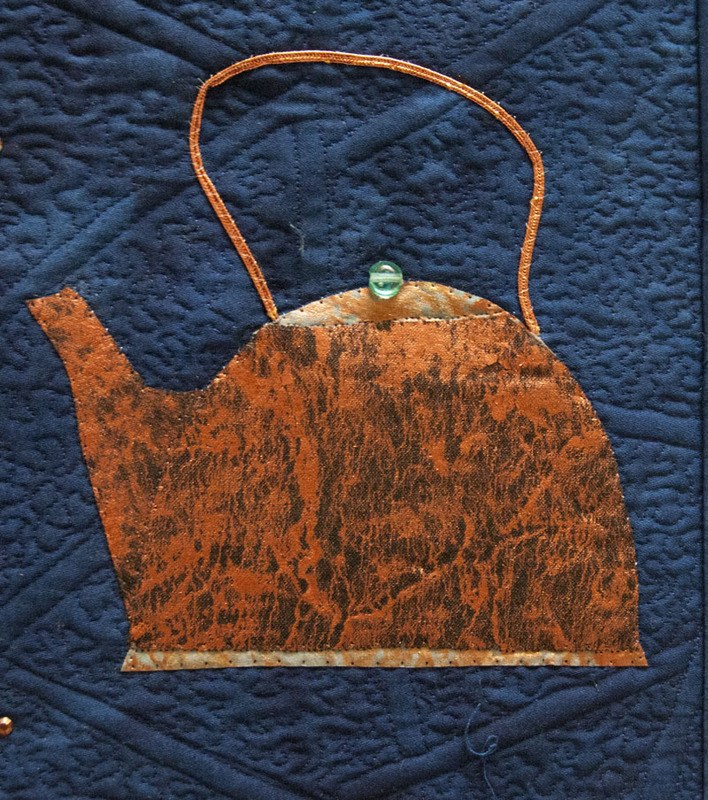 The fabrics used for the copper kettle were also created by Jeanette Viviano. The piece incorporates a variety of techniques including machine quilting, machine appliqué, machine embroidery, couching, photo transfers on silk and cotton, beading, and the use of Swarovski hot fix™ crystals. The use of that glorious cobalt blue background really sets off the “copperness” of your chosen element, Susan. And I really like the use of the wee green bead atop the kettle…another hint to the change copper takes on when exposed to elements over time. Beautiful quilting! Beautiful colors. Love the quilting and the lettering. Pingback: Copper or Cuprium? It’s all Elemental!